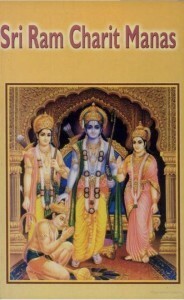 Sri Ram Charita Manas (the Ramayana of Goswami Tulasidas) is an epic Indian poem, composed by the 16th-century Indian poet, Goswami Tulsidas. It enjoys a unique place among the classics of the world’s literature. It was considered to be the best work on Devotion by Mahatma Gandhi. It is universally accepted by all classes of people from Bihar to Punjab and from the Himalayas to the Narmada. According to an old Christian missionary, who is no more in this world, no one could hope to understand the people of Upper India till he had mastered every line that the Ramayana of Goswami Tulasidas had written. Classic epic Indian poem, composed by the 16th-century Indian poet, Goswami Tulsidas. Is Ram Charita Manas available in Hindi, with meanings of the shlokas?? Can you please upload the actual text in devanagari of Tulasi Das Hanuman Chalisa. What I heard is that, to make it easier to pronouce, people from different parts of the country have it their wordings. Like for eg. in some books its written as “Bikata roop” where its actually “vikata rup”..
aranyakand.. Doha no 33, chaupai 01.
in this what is a meaning of brahmanas and sudras. What a great effort and work. Happy to help anyone seeking more information. Jai sri ram, this book is kalptaru..
Tul na tahi sakal mili jo sukh lav satsang. Really it is a good attempt which reached to the unriched people. You are most welcome. Please let me know if you have requests for any other books. By sharing all these books, you are doing a great service to society. And I hope god bless you for that. I cant thank you enough for all the wealth of knowledge you are sharing. As a request, would it be possible to share books by Radhanath Swami, (his book – Journey home) and others which I may not know yet.